Another extremely rare underground record coming out of the P&P camp. 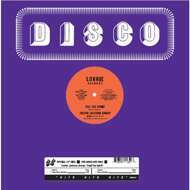 This highly sought after 12” originally released on Lonnie Records is an absolute gem combining Jazz, Funk and Disco. Although there is little to nothing known about the Foster Jackson Group, Feel The Spirit was Mixed by Tim Benedict, who was a recording engineer at Sound Palace Studios in NYC where he assisted greats like Patrick Adams (on a variety of projects), and Jazz-Funk legend Bob James. With that in mind, it’s no wander this track is one that appeals to both the Jazz Funk/rare groove fans and Disco heads alike. An Incredible uptempo mover loaded with a jazzy organ, horns, congas, and funky breakdowns Feel the Spirit goes far beyond the body, it’s all about the soul!